Self-proclaimed food explorers, Jenny Stalder, 28, and Ben Turney, 29, wanted to represent their hometown culinary classics when serving up late-night nourishments at their wedding at Duckridge Farm in Northwest Portland. 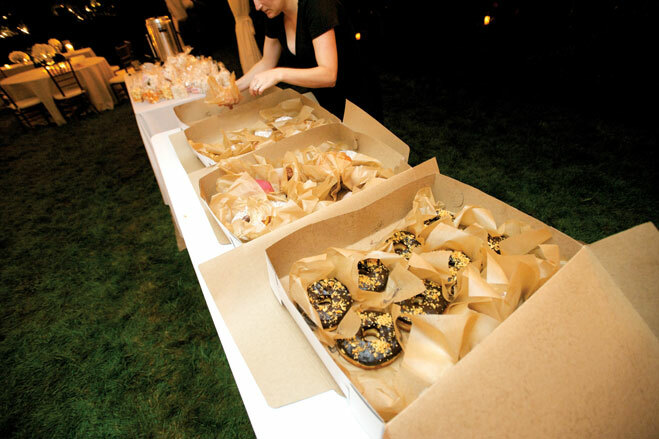 Downtown Portland’s Blue Star Donuts played up Ben’s Portland background and provided the couple’s favorite flavors, such as passion fruit glazed and spiked apple cider fritters. Jenny, a native of Kansas City, Missouri, voted for Poplandia’s savory and sweet gourmet popcorn flavors such as sea salt and vinegar and parmesan. “Popcorn is a big thing where I’m from, and we thought the unique flavors added a Portland flare,” says Jenny. “All those snacks were gone in seconds.” The personal touch? 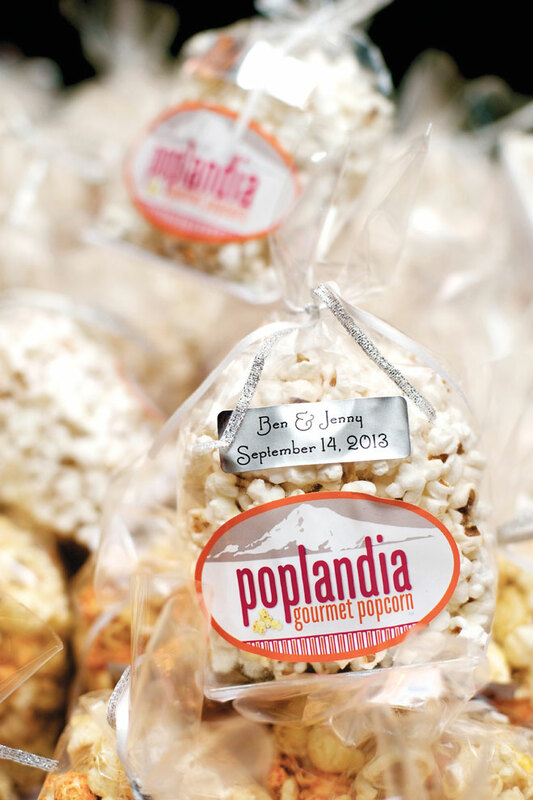 Each bag of popcorn was customized with their names and wedding date and tied with gray and white ribbon to match their fall wedding. Every wedding needs something old, something new, something borrowed, something blue—a color all the more delightful when it’s connected with cheese. You made sure no one would go without sparkles at your celebration. But after all the toasts‚ you may still find plenty of leftover bottles unpopped.